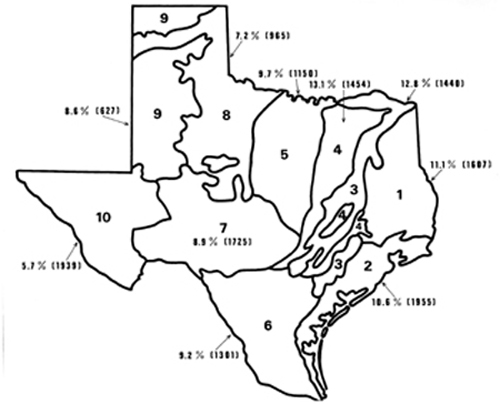 The percentage of exotic plant species (PES) at large geographic scales is presented in form of political maps (Texas and North America) and of isoline maps (Great Britain). In the latter case it is possible to visualize that higher proportions of alien invaders are present in urban and industrial areas as well as in maritime ports rather than in agricultural lands. Consequently, it is possible to predict that the ratio of urban to agricultural species will continue to increase in the future. Based on a survey of 200 world floras, a multiple regression analysis is presented in order to determine the importance of different factors in the yield of PES values. The contribution to the total variance was: disturbance degree 55 %; total species richness 14%; insularity 9%, and latitude 2%. Neither the mean annual precipitation nor the mean annual temperature showed a significant contribution to the total variance. The predominance of Europe as the main deliverer of weeds to other temperate regions in the world has been attributed to the aggressive or imperialistic geopolitics of this region, and to the construction of the first international oceanic fleet. There are reasons to believe, however, that the great size of Eurasia also played a role in the success of its weedy invasive flora. Since several authors found a weak positive correlation between the radial rate of dispersal and the invading success in plants, a table collecting 153 data allowed a first, tentative comparison among different taxa. The mean dispersal rates were 64.2 for microorganisms; 48.5 for invertebrates, 17.2 for vertebrates, 6.9 for plants, and 0.19 km/yr for palynological registers. A discussion about the significance of these results is included. An alternative way to compare invasive ability, especially among agricultural pests, is by means of an index of cosmopolitanism (C*) which varied as follows: 0.642 for phytopathogens, 0.439 for insects and 0.259 for weeds. Weeds are 15 times, agricultural insects 26 times and phytopathogens 37 times more cosmopolitan than, say, common mammals, taken as an example for comparison. Finally, although animals (invertebrates plus vertebrates) show a higher mean dispersal rate than plants (field observations plus ancient pollen registers), it seems that animals are better colonizers of pristine or scarcely disturbed communities, while plants are more successful in anthropic habitats. Key words: invasions, dispersal rates, cosmopolitanism, Great Britain, North America, Texas. Se analiza el porcentaje de especies de plantas exóticas (PES) a escala macrogeográfica en forma de mapas políticos (Texas y América del Norte) y mapas de isolíneas (Gran Bretaña). En estos últimos se observa mayor concentración del PES en puertos y áreas urbanas e industriales más que en áreas agrícolas. En consecuencia, es predecible que la razón entre ruderales y arvenses siga aumentando en el futuro. Sobre la base de un censo de 200 floras del mundo se hace un análisis de regresión múltiple para determinar la importancia de factores que contribuyen a la variación en el PES (disturbios 55 %, riqueza de especies 14%, insularidad 9% y latitud 2%). Precipitación y temperatura media anual no contribuyen significativamente en la varianza. La predominancia de Europa como principal distribuidora mundial de malezas ha sido atribuida a su geopolítica imperialista y construcción de la primera flota marina internacional. A ello, sin embargo, debió contribuir también el tamaño de Eurasia. Ya que varios autores hallaron una débil correlación positiva entre la tasa de dispersión y el éxito invasor en plantas, se hizo una comparación entre taxones mediante 153 datos colectados. Las tasas lineales de dispersión, en km/año, fueron 64,2 en microorganismos, 48,5 en invertebrados, 17,2 en vertebrados, 6,9 en plantas y 0,19 en registros palinológicos. Otra manera de comparar la capacidad invasora, especialmente, en plagas agrícolas, es a través del índice de cosmopolitismo (C*), que resultó ser 0,642 para fitopatógenos, 0,439 para insectos y 0,259 para malezas. Las malezas son 15, los insectos agrícolas 26 veces y los fitopatógenos 37 veces más cosmopolitas que los mamíferos, tomados como ejemplo comparativo. Finalmente, aunque los animales (invertebrados y vertebrados) muestran mayor tasa media de dispersión que las plantas, y son mejores colonizadores de comunidades prístinas o poco disturbadas, las plantas son más exitosas en ambientes antrópicos. Palabras clave: invasiones, tasas de dispersión, cosmopolitismo, Gran Bretaña, Norteamérica, Texas. In order to compare northern and southern hemispheres, from the point of view of invading species, solid information is required on natural as well as on anthropic biotas. The problem, however is that, although data abound for the northern hemisphere, few attempts have been made to synthesize and interpret this mass of scattered information. This fact prevents the making of sound comparisons. The purpose of the present article is to call attention on some rather disparate aspects which seem relevant for a better understanding of the process of dispersal and invasion at macrogeographic scales. Following a previous analysis of the dispersion (spatial distribution) of exotic species performed at micro-to mesogeographic scales (Rapoport 1993), I will consider here four different alien floras at larger scales: (i) the flora of Texas, (ii) the flora of North America, (iii) a small sample of the flora of Britain, and (iv) an even smaller sample of the world flora. All of the analyses reported here must be considered as rough, tentative approaches to the problem of "species pollution" by the exotic non-cultivated (weeds and escapes) component of floras, especially the world flora which only represents a small, non-random sample of a complex problem. Figure 1 illustrates the situation in Texas with respect to the percentage of exotic species (PES), based on Gould's (1975) data. Figures range from 5.7% in the west up to 13.1% in the northeast (Blackland Prairies). 8.5% of the total flora (4,591 species, 1,146 genera, and 166 families for a 682,000 km2 area) are exotic species. This value increases to 11.2% if the data of Shetler and Skog (1978) are used for Texas and Oklahoma together. These authors divide North America and the Caribbean Islands into 18 regions (Fig. 2), covering about 22 million square kilometers. When I analyzed the list of 16,274 species (distributed among 2,350 genera and 253 families), a mean value of 12.7 PES for North America was reached. The minimum is observed in Nevada, Utah and Western Colorado (9.9%), and the maximum in Nova Scotia and Newfoundland (28.4%). The insular portion of the Neotropical Region, however, has the highest figure (36.3%) although it is a suspiciously high value according to M. Rejmánek (pers. comm.) It is interesting to note that, out of the 2,350 genera listed for North America, 19.1% are exotic, i.e., "generic pollution" is proportionately higher than "species pollution". In other words, when a foreign (extraregional) species is introduced, the probability of importation of a new genus is higher than expected by the translocation from a random assortment of the regional flora. This fact seems to reflect not only the problem of importing taxa from different biogeographic regions, but also a tendency to import taxonomic `rarities'. Fig. 1. Percentages of exotic plant species in Texas, U.S.A. The phytogeographic division and original data were processed from Gould (1975). Between brackets, the total number of species considered. Porcentajes de especies de plantas exóticas en Texas, E.E.U.U. La división fitogeográfica y los datos originales fueron procesados de Gould (1975). En paréntesis, el número total de especies consideradas. Fig. 2. Percentages of exotic plant species in North America. The values were calculated from Shetler & Skog (1978). Between brackets, the total number of species considered. Porcentajes de especies de plantas exóticas en Norte América. Los valores fueron calculados de Shetler & Skog (1978). En paréntesis, el número total de especies consideradas. Of course, the latter assumption is valid only in the case of cultivated plants which escape and later naturalize in disturbed habitats. On the other hand, people do not make a discriminating selection of weeds, and weediness - precisely - is a characteristic that is not randomly distributed in the plant kingdom (Rapoport et al. 1983, Heywood 1989). "It is highly likely that the successive immigrations of the more adventurous peoples from the continent beginning in Neolithic times, followed by the Early Bronze Age invasions of the "Beaker" peoples, the late Bronze Age invasion of the Celts, the Iron Age invasion from Hallstatt and, coming to historic times, the Romans, the Vikings, the Saxons, the Danes, and the Normans, as well as later immigrants such as the Walloons who initiated market gardening around Sandwich towards the end of the sixteenth century, all made their individual contributions towards facilitating either fresh introductions of weeds from abroad or reinforcing the stocks of those already present" (Salisbury 1961). Britain is a unique case, not only for its long history of introductions, but also for its insularity and relatively old botanical and zoological records. As it is an archipelago, the possibility of silent, natural invasions occurring normally between contiguous countries, is diminished, making this territory a good place to study. Further, Britain was the first country to start a detailed survey of its flora and part of its fauna, in 1954. This was possible, among other things, due to the relatively small area of the isles. Each species was mapped according to the National Grid (10 x 10 km, totalling 3,650 squares), which covers all of the British Isles. For this study, distribution maps from the Atlas of the British Flora (Perring and Walters, 1976) were used. About half of a total of 346 exotic species mentioned by Clapham et al. 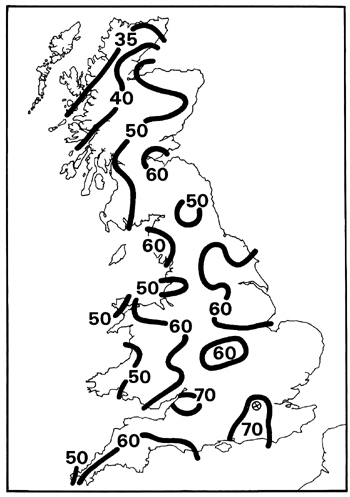 (1952) for the British flora are mapped there, and a "sample" of 165 maps was used for the drawing in Fig. 3. The method consisted in mapping each species onto a 50 x 50 km grid, and then counting the number of species in each square. Using this information, I drew an isodensity map, although the representation of exotics is expressed as percentages of the entire introduced flora. Maps were selected by means of a table of random numbers and they represent only ten percent of the native flora and almost 50 percent of the adventive flora. Fig. 3. Percentages of exotic plant species in Great Britain. Isolines indicate that the proportion of the total exotic flora of the island that can be found in a 50 x 50 km quadrat. They are based on a random sample of 165 species' maps from Perring & Walters (1976). Porcentajes de especies de plantas exóticas en Gran Bretaña. Las isolíneas indican la proporción del total de la flora exótica de la isla que se puede encontrar en un cuadrado de 50 x 50 km. Los cálculos están basados en un muestreo aleatorio de 165 mapas de especies de Perring & Walters (1976). Although quite tentative, the map is greatly informative in the sense that the peaks of maximum species "pollution" are situated precisely in the main industrial centers, cities, or ports, i.e., the main routes of penetration and centers of dispersal. From north to south, we can observe a peak in Edinburgh, then a valley, and another rise between Liverpool, Leeds, and Bradford. 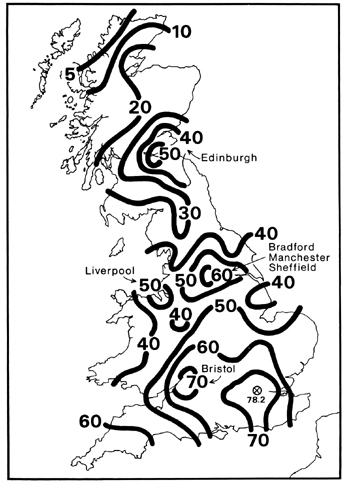 The highest peaks are around Bristol-Gloucester in the west, and London-Brighton in the east and south. London, with the highest percentage of introduced plants (78.2%), is indicated by a small circle and a cross. Another meaningful sign is the fact than southern England, near the Channel, is the most invaded region because of its proximity to the Continent which, supposedly, is the main source of "pollution". In order to compare this map with the distribution patterns of the authochtonous flora, I repeated the same procedure with 165 native plant species mapped by Perring and Walters. The result is illustrated in Fig. 4 which shows some striking differences and similarities. The main differences are: (i) a less rough "topography", indicating that native plants are more homogeneously distributed than the introduced ones. Isodensity lines run from 35 to 70% (instead of 5 to 70% like in Fig. 3); (ii) clumping around cities is less pronounced; and (iii) the English Channel does not show special signs of increased richness with the exception of the Portsmouth/Brighton area. Fig. 4. Percentages of native plant species in Great Britain. Compare with Fig. 3. Porcentajes de especies de plantas nativas en Gran Bretaña. Comparar con Fig. 3. The main similarities are: (i) London-Brighton, Bristol and Edinburgh show signs of a rather increased species richness; (ii) in western Wales and northern Scotland isolines run in a north/south direction, indicating a meridional decrease of species towards the west; and (iii) species richness increases from north to south. This is a natural phenomenon observed practically throughout the northern hemisphere, i.e., climate is one of the main factors associated with species diversity. The only hypotheses that may account for this urban clumping are that (i) native plants are slightly "attracted" by cities (or vice-versa, are slightly "repelled" by non-urbanized, agricultural areas); (ii) city gardeners cultivate native plants, and (iii) some of the plants considered as natives by botanists are actually old imports of unknown origin. The three factors mentioned seem to have an important role to play in this matter, but the destruction of natural vegetation by agricultural practices is probably the most relevant factor. By means of a bibliographic search and a survey form distributed among botanists, I was able to compile information on 200 floras from different parts of the world. In general, data represent vascular plants, but in some cases they were restricted only to flowering plants. Six cases allowed the comparison between the percentages of introduced species in ferns and flowering plants. The differences between them were rather small, ranging from 0.1 to 3.0 percent, with a mean value of 1.0 percent. This would mean that there are more weeds among phanerogams than among ferns but, due to the relatively small number of fern species, the difference is insignificant if we measure PES for all vascular species or only restricted for flowering plants. In fact, the information compiled was insufficient to obtain an isoline map such as those in Figs. 3 and 4, not only because of the few data processed, but also because of the differences between the sizes of the areas composed by the different floras (from 0.002 to more than 2 million km2), and also for the lack of knowledge about the range and status of pristine and slightly disturbed floras. In cases like these, the interpolation among values is impractical. Therefore a stepwise multiple regression analysis was chosen as a valid alternative. The variables taken into account for this purpose were (i) census area (A); (ii) latitude (L); (iii) mean annual temperature (T); (iv) mean annual precipitation (P); and (v) degree of human disturbance (D). L, T, and P were calculated for the gravity center of the area whenever possible. Human disturbance was assigned by means of a heuristic, arbitrary scale from 0 to 5, where 0 = pristine vegetation; 1 = incipient local agriculture or livestock grazing; 2 = intermediate levels of land use; 3 = range management, improved pastures or extensive cultivation; 4 = intensive cultivation, orchards, barns, horticulture, small parceling plus a net of roads or highways; 5 = maximum degree or alteration, i.e. areas with high population density, urbanization, gardening and/or industrialization. Censuses corresponding to unaltered (D = 0) sites were not included, however, because in this survey the representativeness or sampling effort is much lower than in the other communities, and there is no way to assess, with acceptable accuracy, the proportion of these lands in large, presumably "pristine" areas. where PES = percentage of exotic species; N = total number of species; D = human disturbance; L = latitude; and C = insularity. The intercept arises from the origin of coordinates, and the analysis of residuals indicates a linear regression as the best approach. The last parameter takes only two values: 0 or 1 for continents and islands, respectively. On average, the equation predicts PES with ± 10% error. These four independent variables explain 80% of the variance (R2 = 0.799) of PES. Neither the mean annual temperature (the first variable removed from the regression analysis) nor the mean annual precipitation added any significant explanation to it. Similarly, the interaction between pairs of factors proved to be useless in improving the model. Altitude was not considered, and this factor might improve the model since it is known that the PES decreases with altitude, e.g., in California (Frenkel 1974) and Montana, U.S.A. (Forcella and Harvey 1983, Fox and Fox 1986). Altitude data, however, should be used with caution especially in cases of large areas with variable topographies. Summarizing, the variance explained by the different variables is 55% D; 14% N; 9% C, and 2% L.
The following features may contribute to understanding the invasion process. 1. In some taxa the bigger the size of the continent, the larger the mean geographic range of species (Rapoport 1975, 1982). 2. Species with widespread mainland ranges are disproportionately common on islands (Graves & Gotelli, 1983). There is also a positive correlation between the geographic range of plant species in their original region and their colonizing abilities in other regions (Forcella 1985). 3. A positive relationship between local abundance and geographic distribution among closely related, ecologically similar species (same guilds) was verified (Hanski 1982, Brown 1984, and the literature cited there). The most abundant plant species in Berkshire tend to be the most widespread species in Britain as well as in continental Europe (Rapoport et al. 1986) This statement, however, conceals more complex relationships which were analyzed by Gaston (1996). 4. In animal species, before an invasion begins, there is a "presaturation or adaptive dispersal", followed by an increased dispersal rate or "enforced dispersal" (Lidicker 1975, Cockburn 1985). Plant invaders behave similarly (Cousens & Mortimer 1995) as the previous case. In the end, when the majority of invasible habitats are colonized, the rate of dispersal tends to decrease (Crowell 1968, Smith 1973). 5. Recently introduced plants showing initially high spreading rates prove to be the most noxious and widespread weeds (Forcella 1985). It is agreed that the dominance of European weeds was due to (i) the long history of agricultural activities and sedentary (urban) way of life of the Near East, Mediterranean and western European peoples; (ii) the early development of an oceanic fleet and merchant ships, followed by aggressive, imperialistic (sensu Crosby 1986) geopolitics. Human activities, thus, provided the means not only to select for weediness but also gave early opportunities for long distance transportation of European invaders. The great size of Eurasia should also be considered as a factor that may contribute to the great success and predominance of the European weeds at world scale. Tilman (1999) claims that the differences of geographic extent, all else being equal, will favor regions with larger populations and greater genetic variation. "Whatever the cause, some biogeographic realms may be both inherently more resistant to invasion and inherently better at invading than other realms". Supposedly, practically all European plant immigrants in the rest of the world had better chances to become adventives than the late immigrants coming from other regions. All the previous considerations lead to the following question: (i) do dispersal rates of plants and animals differ? ; (ii) do they indicate superior or higher colonizing abilities of any of these taxa? According to Davis (1986), whilst plants disperse at rates of several hunder meters per year, animals disperse at several kilometers per year. This fact would give clear advantages to animals. A comparison between ten continental (from viruses to mammals) and ten marine rates of spread (bryozoans, molluscs, crustaceans, and tunicates) gave non significant differences of their respective 89.0 km/yr and 50.7 km/yr mean rates of spread (Grosholz 1996). An updated analysis of spread was faced by Williamson (1996). Table 1 synthesizes the information available from different sources, some of them not considered by Williamson. Cases of secular migration, as well as isolated cases of outliers suspectedly transported by man or long distance dispersal were not included in this list. No observations on vegetative growth were included because they may provide a false idea on the real progress of a pest, epidemic or invasion where vegetative growth only constitutes a small part of the real dispersal rate. The cases of ultra fast dispersal such a Peronospora tabacina (17.2 km per day, Davis & Main 1986), Melampsora medusae (6.5 ± 8.4 km/day, calculated from data of van Kraayenoord et al. 1974) or Eichhornia crassipes (2.5 km/day, Gay 1960) may be questioned. The latter cases cannot be multiplied by 365 in order to calculate the annual rate of dispersal because they may represent short, local episodes of an occasional `stampede' or a phenological retardation or eclosion of a pathogen in plantations at different latitudes with differences of hours or days along many kilometers. For this reason, comparisons among mean dispersal rates of taxa (Table 1) exclude cases like these. 1 Calculated from the author's original data or map. 2 Based on pollen data. 3 Measured downstream in the Nile of Sudan, during a population explosion. 4 Calculated from Toronto to Quebec. 5 Based on a circular model of dispersal between 1795 and 1925. This is a highly conservative estimation. 6 Observed by the authors between south Alberta and Mackenzie Delta, Canada. 7 Calculated from observations made by Darwin (1845) in Junin and by Prado (1907) in Levalle, province of Buenos Aires, Argentina. The invasion front of the "great thistle" progressed between both localities from 1830 to 1877 (Rapoport 1986). 8 From Ottawa (Canada) 1885 to Urbana (Illinois, U.S.A.) 1951. 9 Without considering jumps. If satellite populations are computed, the average rate of spread increases to 20.5 ± 6.3 km/yr. 10 Average of the first six measurements obtained by the authors (Table 1). The mean dispersal rate was calculated by means of 8-12 radial measurements from the center of dispersal to the border of the range when the original data in Table 1 were provided in the form of maps. The exception was the case of Phytophthora cinnamoni where only two reliable measurements were taken into account. The mean value was used when two or more similar data were provided by the author or different authors. In cases of noticeable differences between dispersal rates, probably representing regional particularities or observations performed at different dates, both cases were included. With these warnings, the biases and pitfalls pointed out by Koening et al. (1966) when measuring dispersal were possibly avoided in my compilation. The majority of data appearing in Table 1 represent the progress of fronts of advance or mass irruptions. Additional data provided in Rapoport (1982, Table 4.3) were used to calculate the mean dispersal rates of Table 2, totalling 153 observations. Table 2 shows some interesting results like, in the first place, the remarkable difference between the average dispersal of plants obtained through direct (6.9 km/yr) or indirect observations, i.e., pollen registers (0.19 km/yr). The apparent slowness shown by the latter may be attributed to problems inherent to pollen deposition in sediments and to species identification, as well as to the slow recession of glaciers. Plants are compelled to recolonize at the pace of melting ice, but not at their own potentiality (Davis et al. 1986, 1991, and personal communication). This has been observed for collembolan insects that advance a few meters off the glacier border (Bödvarsson 1966). Anyway, the dispersal rates assessed from pollen records after the Wisconsian glaciation are higher than measurements of dispersal by means of vegetative growth observed in the field. Secondly, it is surprising that neither invertebrates nor vertebrates differ significantly from plants in their dispersal rates, even though their averages are quite dissimilar. The high variances observed and the low number of observations play a principal role in obscuring the significance of these comparisons. However, if invertebrates and vertebrates data are pooled together in one set, and if plants and pollen records are pooled in a second set, a Mann-Whitney test informs that the probability of being equal is P<< 0.0001. Of course, the clumping of plants and pollen data should be considered as a rather artificial procedure. An early compariso n of the mean geographic ranges of birds and phytopathogens in Africa (3.0 x 106 km2 and 4.2 x 106 km2, respectively) showed important differences (Rapoport & Ezcurra 1979). The problem, however, is that they are different organisms living in quite different habitats. The geographic ranges of pathogens depend on the proportion of agricultural lands, and this is a variable which changes according to the continent and to history. Leaving aside the cases of vicariance and of natural cosmopolitanism, another way of comparing dispersability of different taxa has been by means of a "cosmopolitanism index". This index (C) was proposed by counting the number of species inhabiting from one to six biogeographic regions, including Antarctica, but uniting North America with Eurasia in only one region, i.e., the Holarctic region (Rapoport 1982). In order to give more biogeographic verisimilitude, I will consider here the Nearctic and Palearctic as separate regions, but excluding Antarctica because of its extremely low biodiversity and lack of agricultural development. Using information provided by species distribution maps published by the Commonwealth Institute of Entomology and the Commonwealth Mycological Institute, together with data appearing in Holm et al. (1979) and my own records, I was able to compare the "net" cosmopolitanism (C*) of agricultural pests such as insects, phytopathogens and weeds (Table 3). As a result of a X2 test, significant differences (P< 0.001) were found among these groups, where phytopathogens showed to be more cosmopolitan than insect pests, and the latter were more cosmopolitan than weeds. As it is shown in Fig. 3, a country with a millenary history of introductions such as Britain, still show areas of clumpings or higher densities of adventives. The "hot spots" concentrate in ports, cities and industrial areas, and this feature may be interpreted in different ways. (i) the process of dispersal of alien weeds in Great Britain is remarkably slow, perhaps in the order of centuries. (ii) Britain (and apparently other European countries as well) is not saturated by invaders yet and the process is still occurring. (iii) the successful newcomers are mainly urban species which increase their numbers in human settlements rather than in agricultural fields. If the last statement were true, then the ratio ruderals/segetals or urban/agricultural weeds will probably increase in the future, especially considering that urban areas are still growing. Strong & Levin (1975) concluded that parasitic fungi in Britain are better dispersers than insects. The data presented here corroborate this conclusion, extended to bacteria and viruses. By their own dispersal abilities and their facility in following human activities, phythopathogens may be considered as a paradigm indicating what the biogeography of invading plants and animals will be in the future if the patterns of commerce and transportation do not change. Hughes et al. 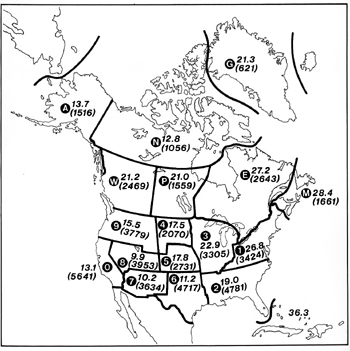 (1994) list eight cases of maximum distances reached by wind-dispersed seeds. Distances ranged between 0.5 and 200 km, thus providing evidence that plants do not differ too much from animals in the dispersal abilities. Animals (invertebrates and vertebrates) are significantly better dispersers than plants only if pollen records are included. Their mean dispersal rates are 29.6 ± 49.6 km/yr (n = 88) and 5.6 ± 9.8 km/yr (n = 47), respectively. This statement, however, involves a complex scenario. Animals seem to be better colonizers of natural habitats while plants currently abound in disturbed habitats, especially those disturbed by man. Plants, in spite of their apparently lower rates of dispersal, have a functional-anatomic feature, the seed, which gives them clear advantages over animals. For example, 1,115 of the immigrant insects into Continental United States (of which 212 are important pests) amount to only one percent of the total insect and mite fauna of the country (McGregor 1973). In contrast, the 1,000 exotic weeds catalogued there represent 6 percent of its entire flora. There are about 10,000 insect pests or aliens at the global scale (1.3% of the total insect fauna registered), but the 12,000 invading plants amount to 4.6% of the world flora. My gratitude to Víctor Arrechea, Luciana Ghermandi and Marcelo Aizen for helping me with the statistical analysis and useful comments. Barbara Drausal processed the information at large scale in the Monitoring and Assessment Research Centre, London, 1976. Important corrections and additions were made after the comments of two anonymous reviewers.